I am in the process of having foot surgery on both feet for bunions. Bunions are a bone condition in the foot where the big toe bone sticks out instead of going straight. So in the operation, the doctor removes a wedge of my bone and inserts two screws and a pin to hold it together while cartilige fills in the gaps. I have had my left foot operated on, and on April 13th, I will have surgery on my right foot. It will be interesting. I wear a cast for a month, then I wear a surgical boot for 4-6 weeks, and then I wear a walking boot for 3-4 weeks. For most of that time, I will be on crutches at school, but only for a week or two at home. It's not as bad as it sounds, but I will be glad to get it over with. It will be fun to be able to wear heels. So this picture shows what both of my feet used to look like...right now, that is what my right foot looks like (with a bunion). Here is a picture of my left foot with my scar. It has faded in a few places, but when you look at it, it is about 3 inches long. It is supposed to fade a lot more so I thought I would show it off now. Haha I'm just kidding. It's not like I'm proud of a massive scar on top of my foot. But it will go away soon! Hi! 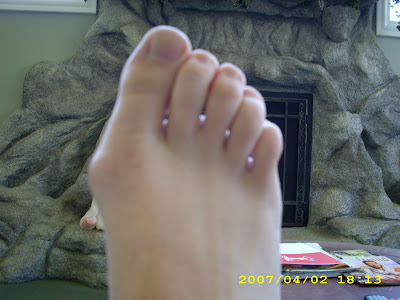 I just stumbled upon your blog when I was googling bunions. 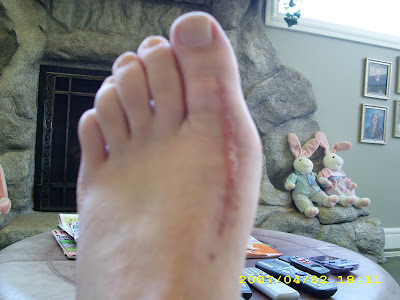 I had bunion surgery 6 weeks ago and my scar look similar to yours- a little more red. I know your post is almost 2 years old, but has the scar faded or gotten any better since? Thank you!